Researchers at Oregon State University have confirmed that last fall's union of two neutron stars did in fact cause a short gamma-ray burst. The findings, published today in Physical Review Letters, represent a key step forward in astrophysicists' understanding of the relationship between binary neutron star mergers, gravitational waves and short gamma-ray bursts. Commonly abbreviated as GRBs, gamma-ray bursts are narrow beams of electromagnetic waves of the shortest wavelengths in the electromagnetic spectrum. GRBs are the universe's most powerful electromagnetic events, occurring billions of light years from Earth and able to release as much energy in a few seconds as the sun will in its lifetime. GRBs fall into two categories, long duration and short duration. Long GRBs are associated with the death of a massive star as its core becomes a black hole and can last from a couple of seconds to several minutes. 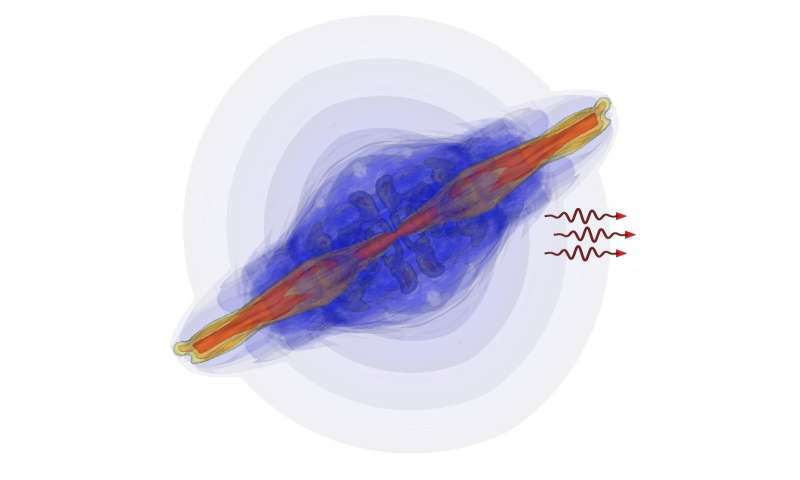 Short GRBs had been suspected to originate from the merger of two neutron stars, which also results in a new black hole—a place where the pull of gravity from super-dense matter is so strong that not even light can escape. Up to 2 seconds is the time frame of a short GRB. The term neutron star refers to the gravitationally collapsed core of a large star; neutron stars are the smallest, densest stars known. According to NASA, neutron stars' matter is packed so tightly that a sugar-cube-sized amount of it weighs in excess of a billion tons. In November 2017, scientists from U.S. and European collaborations announced they had detected an X-ray/gamma-ray flash that coincided with a blast of gravitational waves, followed by visible light from a new cosmic explosion called a kilonova. Gravitational waves, a ripple in the fabric of time-space, were first detected in September 2015, a red-letter event in physics and astronomy that confirmed one of the main predictions of Albert Einstein's 1915 general theory of relativity. "A simultaneous detection of gamma rays and gravitational waves from the same place in the sky was a major milestone in our understanding of the universe," said Davide Lazzati, a theoretical astrophysicist in the OSU College of Science. "The gamma rays allowed for a precise localization of where the gravitational waves were coming from, and the combined information from gravitational and electromagnetic radiation allows scientists to probe the binary neutron star system that's responsible in unprecedented ways." Prior to Lazzati's latest research, however, it had been an open question as to whether the detected electromagnetic waves were "a short gamma-ray burst, or just a short burst of gamma rays—the latter being a different, weaker phenomenon. In summer 2017, Lazzati's team of theorists had published a paper predicting that, contrary to earlier estimates by the astrophysics community, short gamma-ray bursts associated with the gravitational emission of binary neutron star coalescence could be observed even if the gamma-ray burst was not pointing directly at Earth. "X- and gamma rays are collimated, like the light of a lighthouse, and can be easily detected only if the beam points toward Earth," Lazzati said. "Gravitational waves, on the other hand, are almost isotropic and can always be detected." Isotropic refers to being evenly transmitted in all directions. "We argued that the interaction of the short gamma-ray burst jet with its surroundings creates a secondary source of emission called the cocoon," Lazzati said. "The cocoon is much weaker than the main beam and is undetectable if the main beam points toward our instruments. However, it could be detected for nearby bursts whose beam points away from us." In the months following the November 2017 gravitational wave detection, astronomers continued to observe the location from which the gravitational waves came. "More radiation came after the burst of gamma rays: radio waves and X-rays," Lazzati said. "It was different from the typical short GRB afterglow. Usually there's a short burst, a bright pulse, bright X-ray radiation, then it decays with time. This one had a weak gamma-ray pulse, and the afterglow was faint, brightened very quickly, kept brightening, then turned off." "But that behavior is expected when you're seeing it from an off-axis observation point, when you're not staring down the barrel of the jet," he said. "The observation is exactly the behavior we predicted. We haven't seen the murder weapon, we don't have a confession, but the circumstantial evidence is overwhelming. This is doing exactly what we expected an off-axis jet would do and is convincing proof that binary neutron star mergers and short gamma-ray bursts are indeed related to each other." Convincing evidence yes. Proof? No. I agree. Researcher's bias riding the curtails of all this gravitational wave lunacy. Idiot. Have you read the papers, woo boy? If so, let us hear your take on them. Or do you need to wait until geniuses like the idiot Thornhill have spoken, before you make up your mind? W*****s! Seriously, you EU loons are so thick! What did you study, Rossim? Complete sh*te? Because you are very good at it! Loon. OK, thicko. Let us give your sub-human IQ a minute or two in the Sun. Yes? What do you think caused those gravity waves, closely followed by the EM signature? What are your qualifications, woo child? What did you study, before you left school at 12 years old? Please,.....the whole world is waiting on your pronouncement on this matter! Errrr, no, they aren't. Go away woo boy - you haven't got a clue. Correct? So could gravity waves also be proof that dark matter is real and all around us as well, dark matter being the medium that is perterbed in the wave and not interacting via E/M? A 2D frame, with mass above (and what I think could well be dark matter underneath), I actually think the idea they exist in the same space (and time) is actually incorrect - if they did they would interact by one of the other forces instead of just gravity. I.e. dark matter exists under the frame pushing up, mass on the top pushing down - the frame is the demarcation point of E/M and strong forces which they can't cross, but as gravity can bend spacetime it can do it in either direction. The frame in the picture is not real, there is no underneath. The frame is a graph, superimposed on the picture, to represent the curvature of space-time (not just space) and in only a single, 2-dimentional plane. It's not real. None of the rest of what you say makes any sense if you look at the effects of DM that have been observed and documented. Come to that; gravity-waves, seeing as every possible source of mass in the vacuum emanates gravity that due to the Doppler shift as gravity has the constancy velocity of light consequently all matter exhibits gravity-wave.